depicted by Francisco Pacheco ca. 1599 in El libro de descripción de verdaderos retratos, ilustres y memorables varones (The book of description of real portraits, illustrious and memorable men). Luis de León, O.E.S.A. (Belmonte, Cuenca, 1527 – Madrigal de las Altas Torres, Castile, Spain, 23 August 1591), was a Spanish lyric poet, Augustinian friar, theologian and academic, active during the Spanish Golden Age. He was born Luis de León in Belmonte, in the Province of Cuenca, in 1527 or 1528. His parents were Lope de León and Inés de Varela. His father practiced law, and it was due to his profession that the family moved to Madrid in 1534, and then later to Valladolid. Both of his parents had Jewish ancestry, so he would have been considered to be of converso lineage. Luis obtained a very thorough and extensive education, and was devoted to the interpretation and translation of religious texts and ideas. He was proficient in Greek, Hebrew, and Latin. He entered the University of Salamanca at the age of fourteen, in 1541, to study Canon Law under the care of his uncle Francisco. At some point between 1541 and 1543, however, he abandoned his studies and instead entered the Order of the Hermits of St Augustine. After a novitiate of uncertain duration he made his solemn profession as a friar at the Priory of San Pedro on 29 January 1544. The first record of León as a student of theology emerges in the matriculation book at the University of Salamanca of 1546-7. In 1552, Fray Luis graduated with a bachelor's degree in theology from the University of Toledo and continued his education as a student of Hebrew and Biblical interpretation at the University of Alcalá de Henares. Hall of Fray Luis de León in the old building of the Universidad de Salamanca. Having returned to Salamanca the previous year, in 1560 he graduated from the University of Salamanca as a licentiate (7 May) and Master of Theology (30 June), and in the following year he won the election to the Chair of St Thomas, a chair in Theology, at the same university (Salamanca was unusual in that all Chairs were subject to an election for the position). This was a minor Chair, with a limited four-year tenure. In 1565, he won the Chair of St Durandus, to which he was re-elected in 1569 (he lost it in 1573 because he was in prison while the elections took place). In 1566 he was named administrator of the Augustinian College of San Guillermo in Salamanca, and in 1567 he took on the position of vice rector of the University. In 1571 he attained the Chair of Sacred Letters as well. While at the University, he translated classical and biblical literature and wrote on religious themes. He was widely known for his works. In 1571 Dominican professors Bartolomé de Medina and Castro put forth seventeen propositions to the Inquisition documenting Fray Luis’ allegedly heretical opinions. His translation into Spanish and commentary of the Song of Solomon was the biggest evidence presented for their case against him. Another charge touched on his criticizing the text of the Vulgate. As a result, he was imprisoned at Valladolid from 27 March 1572 until December 1576, fell ill and remained in bad health throughout his imprisonment. Though he suffered greatly from his isolation and less than desirable conditions, Fray Luis continued to actively write and study during his confinement. At the end of 1576, the tables turned, and on 11 December Fray Luis was cleared of all charges and released from prison with an admonishment to be more careful and reserved in his publications and speech. He returned to Salamanca on 30 December in triumph. Tradition has it that he began his university lecture on 29 January 1577, his first after returning from four years' imprisonment, with the words Dicebamus hesterna die ("As we were saying yesterday...."). 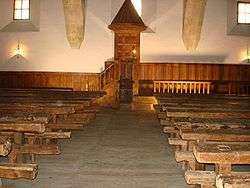 Fray Luis continued to teach at the university, being awarded a special chair at the end of 1576, shortly after his acquittal. In 1578 he obtained, for life, the chair of Moral Philosophy, and in 1579 was elected to the most significant chair in the university, the Chair of Holy Scripture (sometimes known as the chair of Biblical Studies or the Bible Chair). He went on to earn a Master of the Arts degree from the University of Sahagún. Fray Luis did not pay heed to the cautionary admonishments of the Inquisitorial committee after his earlier imprisonment. In 1582, he had another Inquisitional run-in, following three disputations held on the subject of the merits of Christ and human predestination, but was not this time imprisoned. He was absolved two years later, in 1584. Fray Luis's first published Spanish and Latin works emerged in 1580, some having been begun in prison; most of his works were printed during this decade. Between 1583 and 1585 he published the three books of his celebrated treatise, The Names of Christ, which he had written in prison. In 1583 also appeared the most popular of his prose works, The Perfect Wife, an instruction for newly married women. In 1588, Fray Luis published the first collected edition of the writings of Teresa of Ávila. To produce this work, he had performed the task of collating her manuscripts, checking references and notes, and preparing a definitive text (although Teresa and León were both in Salamanca in late 1570, it is not believed they ever met in their lifetimes). He died at the age of 64 on 23 August 1591, in Madrigal de las Altas Torres, Ávila, and is buried in Salamanca in the Priory of San Agustín. Ten days before his death he was elected Vicar General of the Augustinian Order. Statue of Fray Luis de León on display outside the Gran Teatro in Santiago de los Caballeros in the Dominican Republic. In 1561, he began translating the Song of Songs into Spanish for his cousin, Isabel Osorio, a nun in Salamanca who could not read the Latin text, and wrote an accompanying commentary. This was León's first major translation of a biblical text, and was probably inspired by a commentary his contemporary Arias Montano had lent to him when he passed through Salamanca in 1561. Translation of biblical texts into Spanish had been banned by the Council of Trent, so there was a certain risk in this undertaking. The manuscript, however, was popular amongst his friends, who copied it and circulated it privately. However, the translations formed part of the accusations levelled against León when he was denounced to the Inquisition in 1572. Because of the controversial nature of the text, it was not published until 1798. This was published in 1580, and built on an earlier Spanish commentary. He revised and enlarged it in a 1589 edition. This book is Fray Luis’ interpretation of the Proverbs of Solomon, and was written as a moral exposition to his newly married young niece. It advises all young women on the proper behavior and duties of a married woman, both in regard to her husband and her children. The book quickly became a popular wedding gift to young women of the era, as it was an instruction manual for marriage. In addition, this book was a revolutionary defense of women’s roles in society at the time. It was first published in 1583, and was popular, appearing in six editions by 1632. Another well-known work, this was written as a guide to the layman about the essential principles of the church. It is written in dialogue form about three friends who discuss fourteen of the Scriptural names of Christ over a period of two days in a country estate. Each book ends in a lyrical meditation expressed in a poem. The predominant theme is the centrality and universality of Christ. The work grew by stages. The first edition of 1583 is made up of only two books, considering nine names in total. The second edition of 1585 adds a third book, considering four names, and adds the name 'shepherd' to the first book. Finally, the posthumous edition of 1595 includes one extra name, 'lamb'. The structure of the third edition was used for the 1984 English translation. The work quickly became popular in Spain: seven editions were printed by 1605. In 1589, Fray Luis published a volume of Latin commentaries on Obadiah, 2 Thessalonians, Galatians and the Song of Songs. These represent the summit of his achievement as a Biblical scholar. This is another contribution made by Fray Luis to make Scripture available to those who could not read Latin. In other words, he wanted ordinary people to be exposed to the Biblical message. The story tells of Job's patience and suffering, and also serves as a correctional guide to man's behavior. It is written in both verse and dialogue, to make it both enjoyable and informative. León began the work while in prison, and had completed thirty-five chapters by the end of 1580. He resumed work on it ten years later and finished the work in 1591, a few months before his death. He dedicated the work to Mother Ana de Jesús, to whom John of the Cross had dedicated his Spiritual Canticle. Fray Luis had come to know her in recent years, both in preparing the first edition of the works of Teresa of Avila, and in defending the privileges of the Discalced Carmelite nuns against proposed changes in the Teresan constitution. It was first published in 1779. Fray Luis composed a number of poems, the majority probably between 1559 and 1584. He did not publish them, but circulated them among his friends. They were first published in 1631, when Quevedo printed them. The canon of Fray Luis's poetry, as fixed by Hispanists, consists of twenty-nine poems. See two of his most well-known examples below: The Life Removed and Ode to Salinas. In the poem The Life Removed, of which an excerpt is shown below, Fray Luis, following the beatus ille theme introduced by Horace, expounds upon the notion of choice and its consequences. He says that those irrational men who aspire to power and wealth and are guided by the talk and opinion of others will not achieve the peace, happiness, and liberty assured to those who travel the hidden path. The poem continues on to mention a ship in a storm, and how the sailors aboard are motivated only by greed and ambition, and they will not meet the harmonious end of those who travel the hidden path. Trod by the few who conned true wisdom’s lore! The Moor’s skill and on jasper piles to rest. Not that which truth sincere would leave unsung. Another well-known poem composed by Fray Luis is an ode written for his friend Francisco de Salinas. They frequently spoke about art and poetry, and listened to music together. Salinas was an organist and composer, who shared Fray Luis's belief that music can make one more religious, and that it inspires man to contemplate spiritual matters. The ode, an excerpt of which is listed below, includes numerous positive images about music as a means to contemplate the divine and to overcome ignorance and foolishness. "Oda III - A Francisco de Salinas"
bestowing death! O sweet oblivion! to this lower, viler sense. for all the rest is but sad plaint. while to all else they stay asleep. In subsequent centuries, Fray Luis was especially praised in Spain as a poet. In 1631, the poet Francisco de Quevedo prepared an edition of León's poems. In the eighteenth century he was the source of inspiration to various Neoclassical poets. ↑ Thompson states that it was about 5-6 months after beginning studying; other authors often state 1543. This article incorporates text from a publication now in the public domain: Herbermann, Charles, ed. (1913). "Luis de León". Catholic Encyclopedia. New York: Robert Appleton. Rivers, Elias L, Fray Luis de León: The Original Poems, (London: Grant & Cutler, 1983). Luis de León, Luis de León: Ode to Francisco Salinas, trans Michael Smith, (Shearsman Books, 2006). .
F. H. Reusch, Luis de León und die spanische Inquisition, Bonn, 1873. M. Gutierrez, Fray Luis de León y la filosofia española, Madrid, 1885. M. Menéndez y Pelayo, Estudios de crítica literaria, Madrid, 1893. The Columbia Encyclopedia, Sixth Edition. León, Luis Ponce de. Columbia University Press, 2005. Encyclopædia Britannica. Luis Ponce de León. Encyclopædia Britannica, Inc., 2005. Herbermann, Charles, ed. (1913). 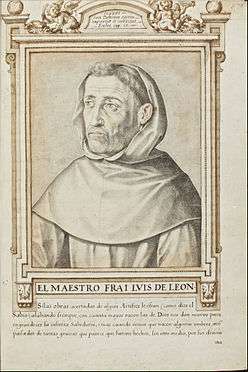 "Luis de León". Catholic Encyclopedia. New York: Robert Appleton Company. Alvarez Turienzo, S. Fray Luis de León: El Fraile, el humanista, el teólogo. Salamanca: Imprenta Kadmos, 1992. Bultman, Dana C. “Fray Luis de León.” Dictionary of Literary Biography: Sixteenth Century Spanish Writers. Ed. Gregory B. Kaplan. Detroit: Thomson Gale (2006): 138-46. Fitzmaurice-Kelly, James. Fray Luis de León: A Biographical Fragment. Milford, Eng. : Oxford UP, 1921. Peers, E. Allison. Spanish Mysticism. London: Methuen & Co, 1924. Thompson, Colin P. The Strife of Tongues: Fray Luis de León and the Golden Age of Spain. New York: Cambridge UP, 1988. Wikimedia Commons has media related to Fray Luis de León. Oda XXIII set to music. Musical version in mp3 of Oda XXIII.